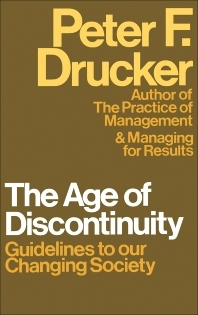 The Age of Discontinuity: Guidelines to Our Changing Society describes the discontinuities that are changing the structure and the meaning of economy, politics, and society. Major discontinuities exist in four areas: the knowledge technologies; changes in the world's economy; a society of organizations; and the knowledge society. This book is organized into four parts encompassing 17 chapters. Each part represents the four areas of discontinuities. Part I highlights the growth in major industries and businesses, along with economic policies related to tax incentives. Part II looks into the status of the global economy, the disparity between the rich and poor countries, and the concepts and application of the economic theory demonstrating a closed economy controlled from within by national, monetary, credit, and tax policies. Part III examines the changes in the political matrix of social and economic life. This part deals particularly with the theory of pluralism and organizations, as well as the creation of socio-political reality. Part IV focuses on the changes in the cost center and the crucial resource of the economy. Knowledge changes involve changes in labor forces and work. This book will prove useful to economists, public servants, sociologists, and researchers. 11. How Can the Individual Survive? 14. Has Success Spoilt the Schools? 17. Does Knowledge have a Future?